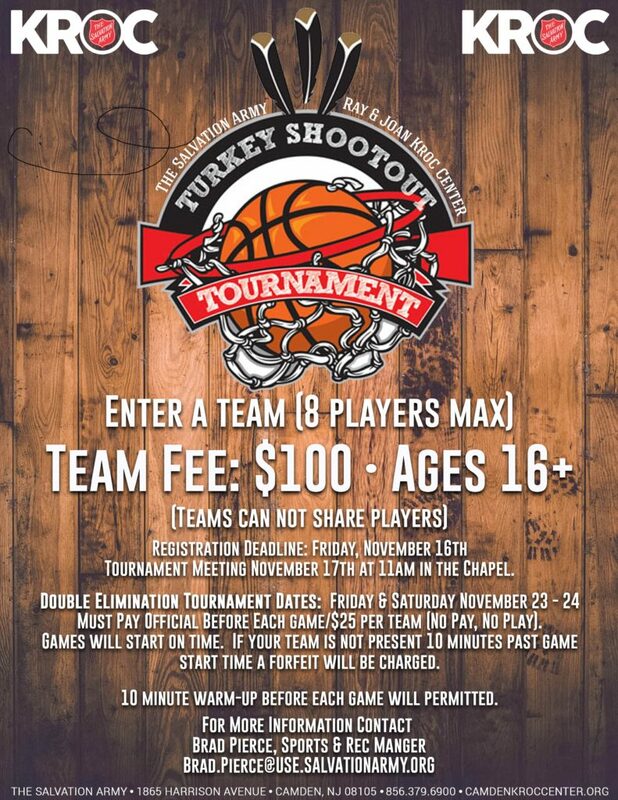 Enter your team for the Turkey Shootout Tournament at the Salvation Army Ray and Joan Kroc Center! You must be 16 or older to play. Teams can consist of a maximum of 8 players. Team fee cost is $100. For more information, contact Brad Pierce, Sports & Rec Manager by emailing brad.pierce@use.salvationarmy.com. Enter your team for the Turkey Shootout Tournament at the Salvation Army Ray and Joan Kroc Center! You must be 16 or older to play. Teams can consist of a maximum of 8 players. Team fee cost is $100. Registration Deadline: Friday, November 16th Tournament Meeting: Saturday, November 17th in the Chapel Double Elimination Tournament Dates: Friday & Saturday, November 23 & 24 For more information, contact Brad Pierce, Sports & Rec Manager by emailing brad.pierce@use.salvationarmy.com.